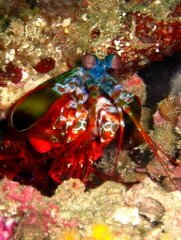 A blog about the great scuba diving around Fiji. Some of the highlights of living and working in Fiji is the diving on the soft coral reefs with sharks, mantas and teeming life on the reefs. This is an official call for entries for the 2009 international photo and video competitions co-hosted by DivePhotoGuide and Wetpixel. Photographers of all levels will help celebrate the beauty, mystery and delicacy of the marine environment as the 4th annual international underwater photography and video competition series hosted by UnderwaterCompetition.com kicks off. The competition has become the “Superbowl” of international underwater imagery competitions, with over $75,000 of world-class prizes, major industry involvement, and the opportunity to have your images showcased to the world as some of the best. Esteemed judges include leading professional underwater photographers, cinematographers and magazine editors from around the world. The unique competition series was founded by professional underwater photographers Jason Heller & Eric Cheng and hosted by popular websites DivePhotoGuide.com and Wetpixel.com. The series is held in association with two leading scuba diving expos on opposite sides of the world, simultaneously - Our World Underwater, now in its 39th year and one of the largest consumer scuba diving expos in the US, and DEEP Indonesia, the first and only scuba diving and watersports expo in Indonesia. Due to the overwhelming growth of the competition series, the official competition website has been given an overhaul and relaunched at Underwatercompetition.com. Participants will compete in technical, themed and video categories, to win more than $75,000 in prizes including premium dive travel, underwater photo and video equipment, scuba diving gear and more! Dive packages include trips to some of the top photo destinations in the world. A complete list of sponsors and prizes are listed on the website. New this year is a novice category in the Our World Underwater competition, which opens up the competition to a far greater number of scuba divers who are casual underwater photographers. As with all UnderwaterCompetition.com events, 15% of entry proceeds will be donated to marine conservation efforts. SureFire Flashlight for pre- dive set-up? GREAT NEWS FOR SCUBA DIVERS! Copyright: Stuart Gow. Awesome Inc. theme. Powered by Blogger.